I mentioned in a previous post about ideas that title is important and how my first book published, Eyes of the Hammer, failed in that regard? As did my second book: Dragon Sim-13. By the time my third book rolled around I was much smarter. Not. I got cute. I invented a word: SYNBAT. You know what that stands for, right? Of course not. Which leads me to my rule of thumb that a title should not need you to read the book in order to understand it. That’s backwards. Unless (because there are no hard and fast rules in writing) the title is evocative enough to get you to read the book and then you understand the meaning. For example, one of my next books coming out will be New York Minute. I think its evocative as well as being the title of an Eagle’s song. The story is set in New York City, so that’s good. And here’s the really scary thing. I didn’t know it when I’d chosen the title and started writing the book, but the Minute thing turns out playing a HUGE role in the story and is central to the actions in the climactic scene. So. Trust the subconscious. Back to inventing a title. I’d started with straight military thrillers in Eyes of the Hammer and Dragon Sim-13. But my mind wanders, as my career clearly indicates. 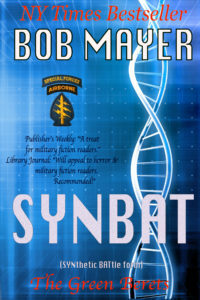 With my third book I drifted toward science fiction as I pondered the idea: how will scientists use genetics to ‘improve’ the soldier? Thus SYNBAT which you knew stood for Synthetic Battle form. Right? This was in the early 90s so the science wasn’t as advanced as it is now, but I projected forward, which is the duty of the fiction writer. I envisioned a merging of humans and baboons to create killing machines. Add on top of that an ability to procreate and fast growth and you essentially have a military virus. As an interesting side note on this book, at the very end a dog plays a key role in saving the day. I named the dog Chelsea, after our Golden Retriever who was with us for so many years. The editor came back and said I can’t name a dog after the First Daughter. That gives you an idea of the time period. So we’re three books into my career and its obvious I’d learned little on the business side of things. I hadn’t been to any writers conferences, wasn’t a member of a writing group. I was basically fumbling my way alone into the publishing business, which is never good.